Here in the West End, we’re pretty fortunate to have the best of Vancouver at our doorstep. The gorgeous Stanley Park is one of the neighbourhood’s biggest draws and is home to countless species of animals, including the Pacific Great Blue Heron. The Vancouver Park Board office is located at the entrance of Stanley Park, and is conveniently located next door to one of North America’s largest urban colonies of the Pacific Great Blue Herons (unfortunately, a species at risk!). The colony is home to approximately 100 active nests, which produced a whopping 175 fledgling herons in 2015! 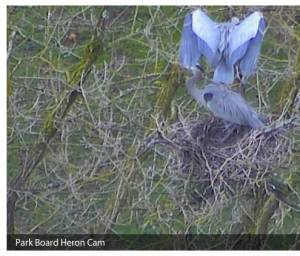 Thanks to the team at the Park Board, we’re able to observe these herons in their natural habitat from our desks via the heron cam, which many consider to be greatest nature show in town. 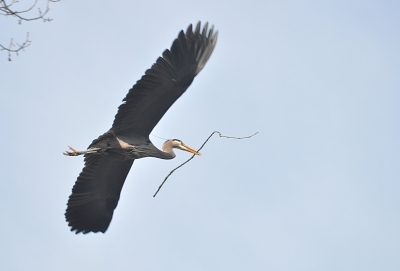 Watch the herons live from Stanley Park via the heron cam, or better yet – make a trip down to the West End and see them for yourself! Share your photos and questions to the Park Board using #HeronTalk!